Jørgen Sonne returned to Italy in 1865 with the help of the Ancker scholarship, established by the Danish art patron Carl Andreas Ancker. Upon his return to Southern Europe, the artist resumed painting idealised representations of the lives of the Italian peasantry on the Roman Campagna. 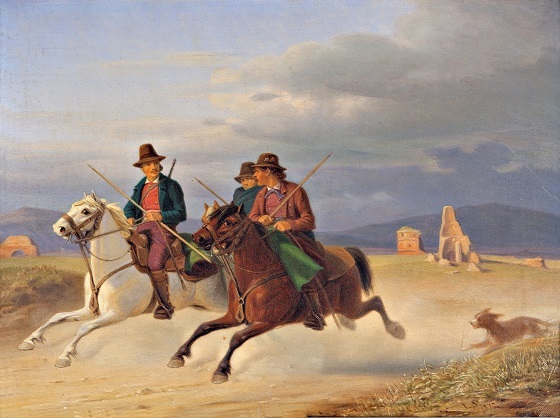 In this painting, the artist has depicted a dynamic moment where three carefree local campagnols are galloping off with a dog in tow. The Alban Hills can be sighted in the distant background, while menacing grey clouds are fanning out across the sky. The artist has sought to engender a sense of speed and volatility in his depiction of the galloping horses, which appear as though they are almost about to leap out of the picture frame. Sonne stands out among his generation’s Danish painters by not having been studied under C.W. Eckersberg. Instead, he sought his artistic impulses other places, including Munich, where he was trained as a battle painter. He depicted battle scenes from the war in 1864, where the museum’s founder Johannes Hage was at the frontline. Sonne’s figure compositions follow a stylised and monumental aesthetic, but his landscape studies are more free and sketch-like. Between 1831-40, Sonne lived in Rome, where he was primarily interested in atmospheric depictions of peasant life in genre painting. In 1846-50, Sonne carried out the friezes at Thorvaldsen’s museum with the characteristically stylised figure groups in cement plaster.